Let's be clear, the Samsung Gear Sport is not the Gear S4. Samsung's made it plain that it still considers the Gear S3 its flagship smartwatch going into 2018. Instead, think of the Gear Sport as the new Gear S2. The name should tell you that this is more angled to health and fitness, but it also doesn't have LTE and lacks a couple of features of the S3, but is thankfully more comparable to the S2 in size. The Gear S3 is a big ol' smartwatch. The core experience is very similar to the S3 though, with everything centred around Samsung's Tizen OS. We talk so much about the battle between Apple Watch and Android Wear that it's easy to sometimes forget how far Samsung has come. Where it could have taken the Android Wear route like plenty of others (and did briefly with the Gear Live), it's ploughed ahead with Tizen and forged its own path. It's paid off: Tizen really shines on the Gear Sport. But there are new players in town, including the Apple Watch Series 3 and Fitbit Ionic, not to mention Polar and Garmin still pushing ahead at full throttle. If Samsung's going to go all in on a fitness smartwatch, can it stand up to those who have already made their name here? I like the look of the Gear Sport but I'll totally understand if you tell me you prefer the S3. The square-circle is a little less conventional and doesn't give off the same classic watch look as its larger sibling, but there's no arguing that the 42.9mm case is more reasonable than the hefty S3. The interchangeable straps too are more narrow; now 20mm compared to the S3's 22mm. Samsung is the master of wearable screens, and the 1.2-inch super AMOLED display on the Gear Sport is gorgeous with a 360 x 360 resolution and a vibrant 302ppi, protected by Corning Gorilla Glass 3. You also get 5ATM water resistance – so 50 metres – which is one of the Sport's killer edges over the S3. The Gear Sport can now be taken for a swim, and you'll be able to use Samsung's own swim tracking software or download the Speedo On app instead. To help Samsung track your heart rate in the water, the Sport's heart rate sensor protrudes a little from the back to keep it locked on the skin. While the Gear S3 has a more pleasing, traditional watch aesthetic, the smaller, less obtrusive Sport is going to appeal to a lot of people who just found the S3 too beefy and, like us, wondered what the hell had happened after the S2. Meanwhile new watch faces blend nicely with Samsung's strap options, which include silicone, NATO-style fabric and a hybrid leather to make that display pop. 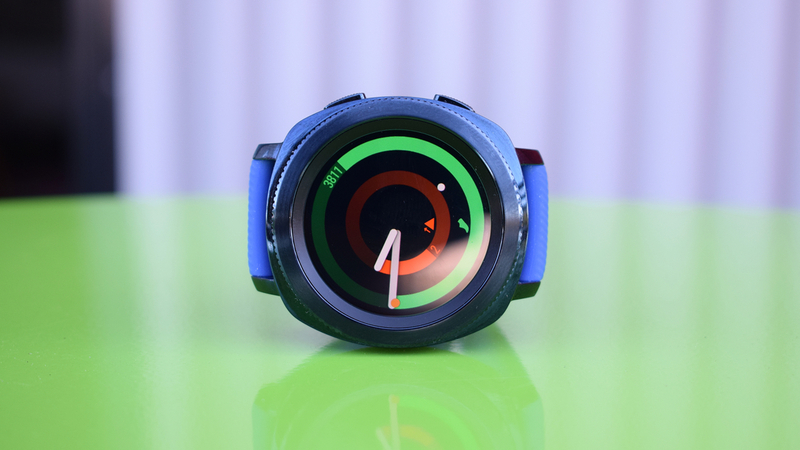 This is not a bad looking smartwatch at all and its slighter profile is congruent with Samsung's plan for you to keep it on all day, taking it running or swimming without feeling like it's weighing you down – which at 67g it shouldn't. The downside of a smaller design is that a few features have taken a hit, including Samsung Pay, which now only works with NFC and not magnetic strip readers. This was a big edge Samsung had over the competition, as it meant you could use Samsung Pay in any store that had a magnetic swipe reader, vastly increasing the support. You can still use it with NFC readers, just like Apple Pay and Android Pay, but it's a shame to see Samsung drop MST. Also note that iOS users, while getting largely the same experience as Android phone holders, won't be able to use Samsung Pay. One edge Samsung hasn't lost though is Spotify offline playback, which is a real lure. Nobody outside of Samsung is offering this, yet it's easily one of the most asked-for features of wearables. You can sync music either via the phone's Bluetooth connection, which I had a spot of trouble with, or by connecting your watch to your Wi-Fi, which worked more smoothly. Once logged in (a bit of a painful exercise in precision with the tiny keyboard) you can browse all of your playlists and toggle whichever you'd like to download. You'll then just need to pair some Bluetooth headphones to listen. Once I was logged in, using the Spotify app and downloading music worked like a charm. You've got 4GB of built-in storage to stick those playlists on, which is about 500 songs. This is especially handy as Samsung has dropped LTE support on the Gear Sport. I wouldn't be surprised to see a cellular edition pop up in the future, but for now you won't get the additional connectivity that the Gear S3 or Apple Watch Series 3 bring. The extent of how much this is a bad thing, I feel, will vary on an individual basis. Some people just won't care, and with offline Spotify along with all of the other features, like GPS, that work without a tethered phone, you're only going to be missing out on notifications when away from your phone. For others, well, there's the S3. I've talked a lot about what the Gear Sport lacks, but what does it have? Health and fitness is the name of the game here and Samsung's latest comes packing heavy in the sports department. Like the Apple Watch – and unlike Android Wear – Samsung's wearables are heavily integrated into the Samsung Health platform. That means you'll probably spend a lot of time in Samsung's app, but there are other options here too including Under Armour's suite of apps which make a return and include MapMyFitness, Endomondo and MyFitnessPal. While Strava integration is possible, sadly there's still no standalone Strava app on Samsung's wearables, something we hope will change before long. The Sport is all about daily wellness too, and will continuously track your heart rate, steps, floors climbed and calories burned through the day. On a walk? The Sport is good at auto-tracking activities in the background, and you'll see them all registered later in the Samsung Health app, while the watch will give you little message of encouragement as you strut the pavement. But Samsung has been busy developing other aspects of its fitness ecosystem too, including calorie tracking which you can now do from the wrist. This makes it easier to keep tally than putting them in your phone, granted, but you still need to know how many calories were in that cupcake you sneaked just before lunch. There is a neat workout mode with Note 8 smartphones, where you'll find 50 workouts. Start these on the phone and you can follow them from your watch, skipping or pausing as required. What's more, you can link your smartphone to a Samsung TV using Samsung Connect (everyone has a Samsung watch, phone and TV, right? Thought so) and your heart rate will display on the screen, as they all work in perfect harmony. If that's your thing. Then there's swimming. On the Gear Fit2 Pro Samsung brings its partnership with Speedo to the fore with the built-in Speedo On app. While we were able to try it out on the Fit2 Pro it wasn't available to test at the time of reviewing the Sport (it doesn't come pre-installed), but you also have Samsung's own swim tracking app to use instead. This covers just about everything Speedo On does, including heart rate, something most devices don't try to for the simple reason that sensors and water don't mix well. Sure enough, at the end of each swim we got a nice smooth graph of our pool session heart rate. Unlike with the new Gear IconX you won't get access to Bixby on the Sport – Samsung told Wareable this is something it's still exploring – but you've got a handful of other Samsung apps to play with, like S Voice, all baked into Tizen, all the more charming with its rotating bezel. Oh yes, you didn't think Samsung was going to ditch one of the S3's best features did you? Rotating the bezel to move around Tizen's circular OS is as satisfying as ever, while you can use it from the clock screen as a shortcut to your most-used features. Scroll left and you'll see any notifications you haven't dismissed, be they messages from friends or updates to tell you that you did it, you reached 6,000 steps. You can respond to some notifications using pre-set responses, voice input or, if you're feeling really brave, the keyboard. Again, this is something iPhone users won't be able to do. And because the Sport shares the same Tizen experience as the S3, you have access to all of the same apps out of the box. Samsung's app offering was limited for a long time, but things are a little better now, and the Under Armour Suite as well as Spotify really bolster Samsung's smartwatches. We'd still like to see more on offer here, though. So how do the new fitness features work out when put to the test? Varyingly. Running with the Gear Sport has produced similar results to the Gear Fit2 Pro, in that it's going to struggle most in interval running. In the graphs you can see below, I did some hill running towards the end to get some peaks and troughs, and the Sport wasn't able to match the Polar H7 chest strap, leaving me with more level curves by Samsung's account. It was consistent with the rest of my time spent running with the Gear Sport; often I looked at the live readout against the chest strap to see it registering around 10bpm out, and it was always a case of it catching up, particularly when – like with those hills – my heart was doing sudden peaks that seemed to catch it off guard. With less intense climbs and drops it performed better, but if you're after something that can handle intervals, forget it; if you're looking for something for less intensity, it might be enough. GPS was spot-on in testing though. And what about swimming? The Speedo On app wasn't available to test at the time of review, but the tracking was hopelessly off when used with Samsung's own swimming app. I actually put it up against the Fit2 Pro which was running Speedo's app and the Gear Sport was reading significantly more yardage than the Pro. Now, it could be a case that the Speedo's swim app just has better accuracy (though it was still a fair bit off in testing the Fit2 Pro), but even so that's not great. In fact, I had to stop swimming and check I hadn't set the pool length incorrectly, but no, I had got it right – so I started again. Same problem. I'd set the watch to the correct 25 yard length of the pool, but what seemed to be happening was that every three laps or so it would register another 25 yards – which meant the margin of error quickly grew. Hopefully this can be fixed with software updates, and like I said I'm yet to try the Speedo On app with the Sport so I'll update this review once I have. Battery life is one of the Gear S3's sucker punches, and it's certainly good on the Sport too. Samsung claims between three and four days, but that drops to 14 hours with GPS – which has proven to be about right in testing. It feels like a real luxury to not have to charge a smartwatch of this level every day, and right now Samsung and Fitbit are putting Apple and the Android Wear cartel to shame. The Gear Sport sits between the Fit2 Pro and the S3; in many ways it's a refined Gear S2, honed more towards health and fitness. It can't be faulted for lacking features, but the sensors for running and swimming struggled in testing. This is Samsung's best smartwatch yet, packed to the gills with features, but performance problems stop it fulfilling the potential of its sporty new name. - No Nike+ App compatibility. I just want to continue what I started, and so I choose Garmin Vivoactive 3 instead. I'm bitterly disappointed with it as a running watch. Live pacing is woeful, though it is giving accurate feedback at each km, the pace showing can be 50% out either way. eg 7minutes passed at 1km (I didn't say I was fast) but throughout that km my pace was showing as 10:40. Another day running 5k, my pace was showing as 4:20 throughout (if only). Mostly get reasonably feedback at end of run (though sometimes it loses distance, up to 10%,),, so why is live info so far out of wack? I'm working on my pace so want to know how fast I am going not how fast I went. Samsung support no help at all. despite the sales info saying it is a standalone GPS device, they insist it will only record accurately when connected to a phone with a data connection. I now always carry with a phone with a data connection, it still can't give a live pace.